20 Cavendish Square is the home of the Royal College of Nursing. After an extensive refurbishment of the building, and prior to the reopening of the venue, Naked Creativity were appointed to design a new identity, brochure and website. 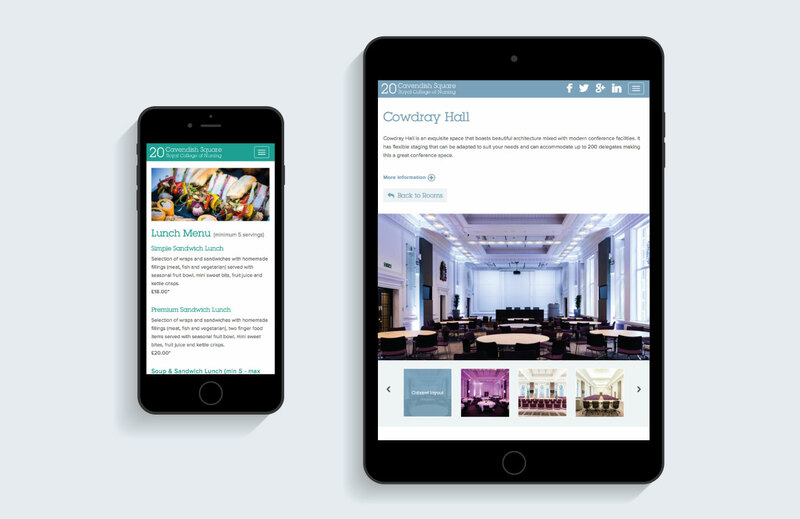 The new identity and colour scheme was designed to complement the contemporary interior design of the refurbished venue, and to be usable across a variety of applications from printed stationery to social media profiles. The majority of information is sent to prospective customers via email, or downloaded directly from the website. The latest update to the website creates PDF versions of menus automatically, reducing time and cost when updating this information. Rather than an extensive printed brochure for the venue, there is instead a small mini­brochure which has key information on location, main rooms, and catering. The most up­to­date information is available via the website. The website itself is fully responsive for use on mobile or desktop browsers, and the content is managed via our content management system Cee.ms. 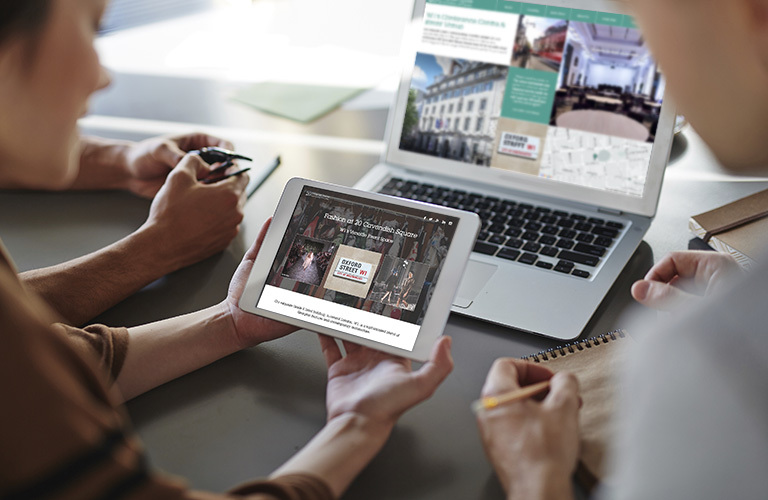 This allows the 20 Cavendish Square team to update any aspect of the website at any time. They can also create campaign­specific landing pages, to target specific market segments, such as London Fashion Week. These campaign pages are designed to be self­contained with all the key information, tailored to a particular audience, and promoted via pay­per­click adverts and email marketing. These pages are long scroll pages with a clear call­to­action which is tracked via Google Analytics to gauge the success of each campaign.